Seattle embraced dockless bike shares, but bans scooter ones. How come? Mayor Jenny Durkan has cited safety concerns, noting a Washington Post report that scooter-related emergency room visits have spiked in cities after scooter shares come to town. A little over a year ago, Seattle led the nation, becoming the first major city to open its streets to shareable bikes that didn’t need docking stations and could be left almost anywhere. A year later, Seattle has taken the opposite tack with a similar technology that’s proven more popular than the bikes. Seattle has banned dockless scooter-sharing companies from the city’s streets, with no word on when, or if, scooters might join the city’s coterie of transportation options. The scooter companies — tech firms that barely existed a year ago and now are worth billions of dollars — are clambering to get in, regularly contacting city officials over the past several months to pitch themselves as traffic solutions and assuage safety and sidewalk concerns. Both Lime and Bird, the two leading scooter companies, say they’re operating in more than 100 cities now. 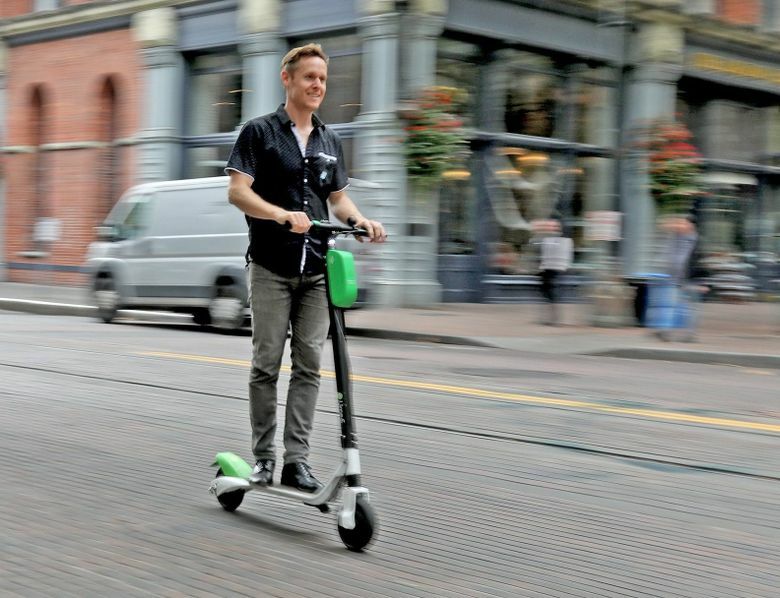 There are scooter shares not just in San Francisco, Los Angeles and Austin, Texas, but in Portland, Tacoma and Spokane. With the Alaskan Way Viaduct coming down in January and Seattle headed toward several years of “maximum constraint” on downtown streets, scooter companies and their boosters argue they can offer a space-efficient, environmentally friendly, car-reducing way to get around the city. But the city’s not having it. The Seattle Department of Transportation wrote to scooter-share companies last spring, saying they were not permitted to do business here until the city set up a permit program, and that the city wouldn’t have a permit program for scooters until it set up a permanent bike-share program. The bike-share program was finalized over the summer, but nothing’s changed on the scooter front. Mayor Jenny Durkan has continued to ban scooter shares in the city. Stephanie Formas, a Durkan spokeswoman, said the mayor has talked about scooters with other mayors across the country and would want to study other cities before trying them here. She specifically cited safety concerns, noting a Washington Post report that scooter-related emergency room visits have spiked in cities after scooter shares come to town. Seattle’s first year of stationless bike sharing had very few injuries, according to unpublished findings from Harborview Medical Center, but electric bikes weren’t yet available for much of the study period. And Seattle law currently bans scooters from places where bikes can go — sidewalks and bike lanes. Gabriel Scheer, director of strategic development for Lime, said the city is right to be concerned about safety, but he noted that cars kill about 30,000 people a year in the U.S.
Bird declined to be interviewed on the record but said in a prepared statement that the company is “incredibly interested” in the possibility that they could help during Seattle’s upcoming period of maximum constraint. The company has launched what it calls an Ambassador Program. It’s offering a free, personal scooter to a “limited group of individuals” in Seattle to “help familiarize people” with Bird. Scooter shares operate much like the dockless bike shares that have been in Seattle since last summer. You can find them on the street, unlock them with a smartphone app, leave them at your final destination. They’re standing scooters (think Razor, not Vespa) with a small electric motor that maxes out at 15 mph, although they can go faster than that downhill. Over the last year, they’ve been deployed in dozens of cities with huge popularity, but also with matching pushback. Lime, which operates scooter, bike and electric-bike sharing, says scooters are the most popular, by far. 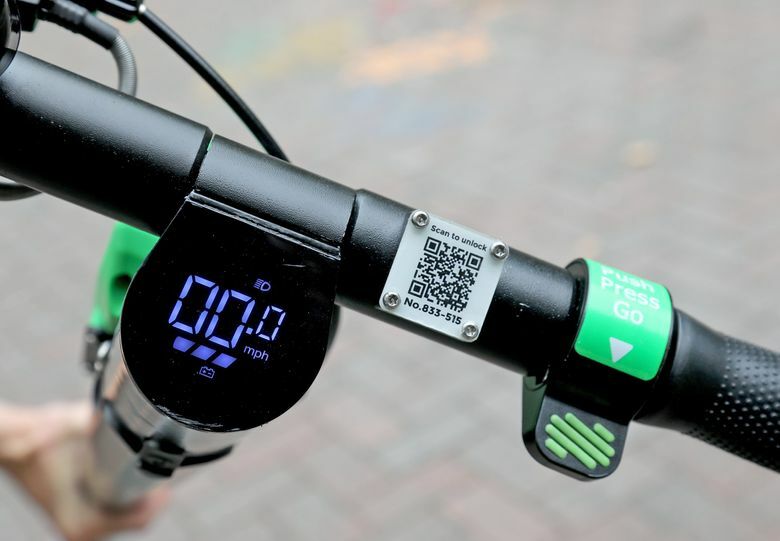 The company said that for each time one of its standard pedal bikes gets used, an electric bike is used more than two times, and a scooter about five times. Scheer, of Lime, said that pedal bikes “stop making sense” at the fee levels that Seattle is charging bike-share companies to operate in the city ($50 per bike per year). The company recently raised prices on its pedal bikes from $1 per 30 minutes to $2.50. Its application to the city, filed in August, says it will move to 100 percent electric bikes in Seattle by early 2019. Stationless bike sharing in general is proving to be a tenuous business model. Ofo, the Chinese bike-share giant, recently pulled out of almost every American market, Seattle included. Spin also pulled its bike shares out of Seattle and now promotes itself exclusively as a scooter company. One reason commonly cited for scooter popularity: It’s a lot easier in a suit or skirt to ride a stand-up scooter than a bicycle. Scheer said that they’ve also found, anecdotally, a large number of people who view themselves as noncyclists and so they won’t try the bikes. Three people who saw me testing a Lime scooter in Occidental Square (it was zippy, a little bit scarier than I expected, but very easy to get the hang of) stopped to ask if scooters were coming to Seattle. Andrew Evans, 28, moved here from Nashville in February. In visits back since, he used Lime and Bird scooters to replace Uber rides. But he hasn’t used bike sharing since he’s been here and has no plans to. But the scooters have raised hackles in cities where they operate, especially in places where companies barged in and dropped scooters on the street without permission. Nashville, Tennessee, sent Bird a cease-and-desist order earlier this year, accusing the company of using public sidewalks without permission. The city has since passed legislation allowing scooters to return. A similar scenario played out in San Francisco, where the city ordered the scooter companies to find a solution for improperly parked scooters, and then made them shut down. The city has since reopened its streets to scooters, but it has not allowed Bird, Lime or Spin to return, after the three companies had opened up shop without permission. Closer to home, Portland, Spokane and Tacoma have launched pilot programs within the past two months that include scooter sharing. Tacoma has a mix of 250 electric bikes and scooters in its 60-day pilot. Tacoma City Councilmember Ryan Mello said the city didn’t give much thought to distinguishing between bikes and scooters, although he expected scooters to be more popular. “We’re very excited to try it out and give people a new opportunity to get around in an inexpensive way,” Mello said. Spokane is running a two-month pilot program with 200 bikes, electric bikes and scooters. After a little over two weeks, each pedal bike was ridden an average of three to six times per day and each electric bike was ridden four to eight times per day, according to Lime data forwarded by the city. Each scooter was ridden nine to 16 times per day.